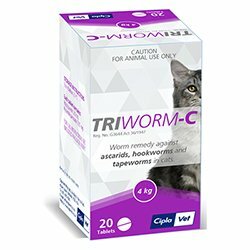 Triworm-C is a potent deworming treatment effective on both cats and kittens. It comes in a pack of oral tablets that are easy to dose. It fights against the intestinal worms and prevents infections from ascarids, hookworms and tapeworms. Triworm-C is composed of 2 active ingredients - Praziquantel and Pyrantel Pamoate. Praziquantel is an anthelmintic agent that eliminates the larvae stages while Pyrantel pamoate, also an anthelmintic agent fights against the adult worms. It acts by paralyzing their nervous system and eliminates them. 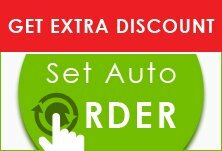 The combined action of these ingredients aid in removal of the internal parasites from the cat.